Bank of Baroda SO 2018 Recruitment Notification: Bank of Baroda (BOB) has released the Notification of various posts for Specialist Officers. 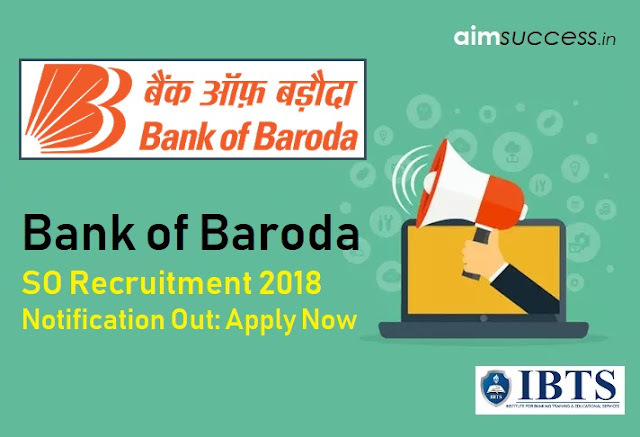 BOB is one of the leading public sector banks in India and here is a great opportunity to work as Specialist Officer. Just make sure that you get yourself ready for the battle this year. Make this fight worth remembering. Give your best and we, The IBTSINDIA & AIMSUCCESS Family, will help you all with every step you take. Education Qualification: Graduate from Government recognized University or Institution. Preference will be given to candidates having MBA or equivalent degree from reputed Colleges. The candidate should have adequate experience in building and managing relationship with High Net Worth Clients [Clients having a minimum Total Relationship Value (TRV) of `.20.00 lakh]. Minimum 6 years of experience as a Relationship Manager in Wealth Management out of which minimum 2 years’ experience as a Team Lead. Excellent Knowledge of Equity Products, PMS, Mutual Funds and Advisory  Should have Exposure to CRM  Proven track record of High Performance and Leadership  Should have relevant work experience at national level with large Wealth Management organizations. Education Qualification: Graduate from Government recognized University or Institution. Strong analytical & execution skills.